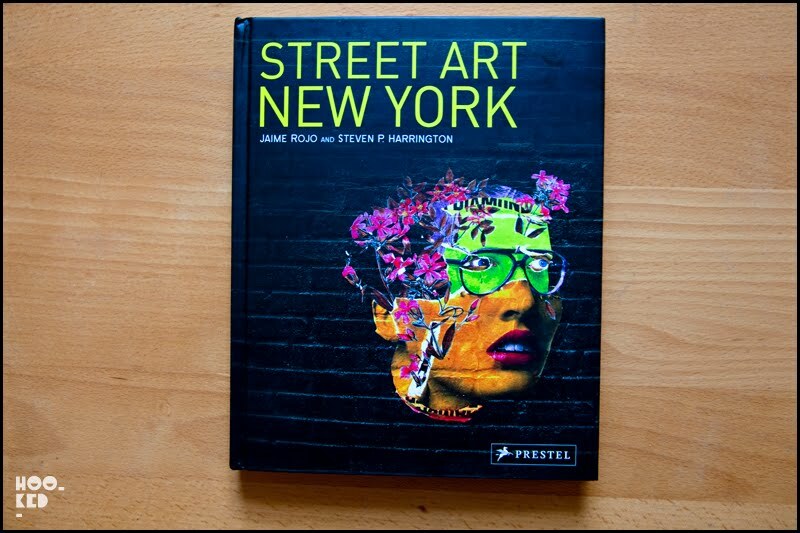 A little late, but we have finally found some time to check out 'Street Art New York ' a newly released Prestel publication compiled by Brooklyn Street Art blog editors Jaime Rojo and Steven P. Harrington. We can imagine some people are rolling their eyes and screaming not another street art book! 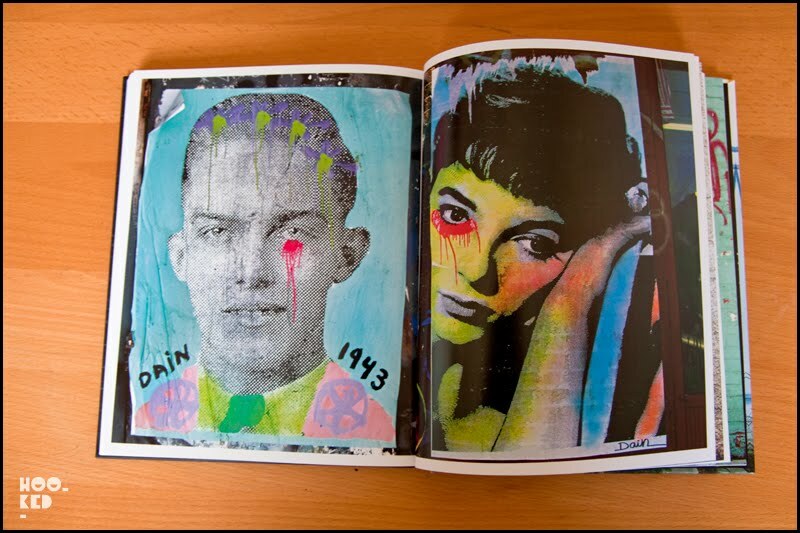 Yes the last few years has seen an explosion of Street Art publications, but Street Art by it's very nature is ephemeral and short lived (for the most part) and needs to be documented and recorded. 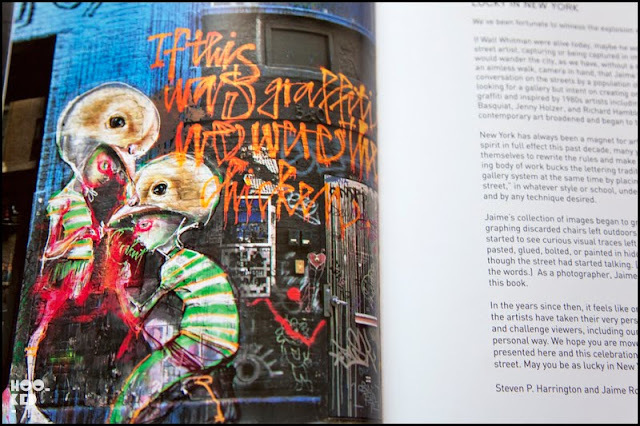 Plus the lower costs of digital SLR cameras in recent years has given rise to a huge surge in Street Art photographers and as such I really can't see the street art book thing slowing down anytime soon as the Street Art phenomina continues to grow globally. 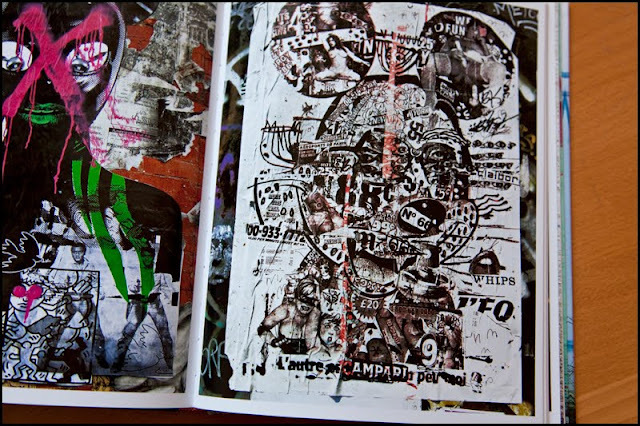 So back to the book, what if anything makes 'Street Art New York' stand head and shoulders above some of the other streetart books out there. Often I find with a number of these photographic books is they have great content but suffer from poorly presented/printed books. The publishers in-house team generally flows the content into standard templated layouts with the resulting covers of these books looking desperate to be edgy and street with their faux spray painted font titles, complete with drips and splats all screaming uncool. Jaime Rojo and Steve P Harrington clearly have had alot more input than most into their New York Street Art book as is clearly evident from the striking cover design featuring the vibrant street work of street artist Judith Supine. What's in the book, well as the title suggests some of New York's finest street artists to have work on the streets over the last few years. Packed with 200 images of works featuring the newcomers and the old masters, including some of our favorites: New Yorkers Swoon, Judith Supine, Dan Witz, Skewville, WK Interact, L.A.’s Shepard Fairey, Brazil’s Os Gemeos, Denmark’s Armsrock, France’s Space Invader, C215, Mr. Brainwash, Germany’s Herakut, London’s Nick Walker and the infamous Banksy. As New York street art goes, we have always been a massive fan as it was this city that first opened our eyes to the street art scene many years ago. We will never forget stumbling on a huge WK Interact piece wrapped around the whole side of a building in Manhattan. We were blown away by the street pieces and instantly became hooked. For us the NY street scene as a whole has a much more grimmy feel to the street work than that of London which this is reflected in many of the photos contained within the book and as such makes this a welcome addition to the Hookedblog - UK Streetart Blog bookshelves. The book is available now and can be purchased on Amazon here.